The Quayside in Newcastle was flooded on the afternoon of 5 December 2013 after a tidal surge saw the River Tyne reach its highest level for 30 years. 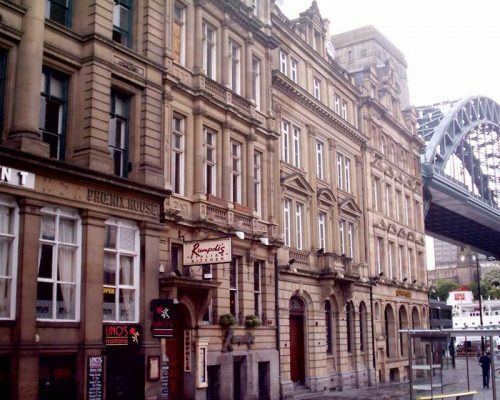 The Quayside in Newcastle closed from the Law Courts. Pubs and businesses were flooded as the waters of the Tyne rose and inches-deep water poured over the roads and pavements. A 400-m stretch between the Tyne Bridge and the Millennium Bridge was flooded almost instantly, and traffic came to a standstill. Photos © architect Adrian Welch from 16 Jun 2009 of this popular pedestrian area along the north bank of the River Tyne in Newcastle, facing Gateshead across the river to the south. The Quayside includes the following restaurants and bars: the sophisticated Terry Laybourne’s Cafe 21 ; Sabatini’s serves authentic Italian dishes ; rooftop restaurant SIX at BALTIC which creates modern British cuisine with a twist ; The Sage Gateshead Brasserie serving locally-produced food and a fine selection of wine ; O de V, a new restaurant on Gateshead Quayside with the finest steaks.